Facebook Promoted Posts make reaching a larger audience — or more of your current audience — painless and simple. But that simplicity comes at a cost: Control. When you promote a post on Facebook, you have minimal control over your bid type, budget, promotion period and interest targeting. 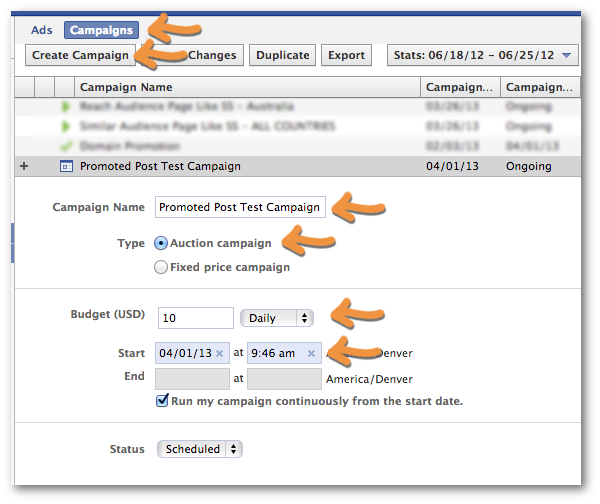 It’s a cookie cutter solution that only allows you to bid with Optimized CPM, giving you a handful of budget options for a campaign that will run for up to three days. As great as these ads are, I want more control. I want to create multiple targeting options of my ad to see what is most efficient. Sometimes the audience I want to reach with my organic post isn’t the same as the audience I’m willing to pay to reach. I often have people ask me how to edit Facebook Promoted Posts. You can’t. The purpose of this post is to step you through exactly how you’d recreate a Promoted Post in Power Editor to give you the control that you need. Most marketers don’t understand that this happens when you promote a post. 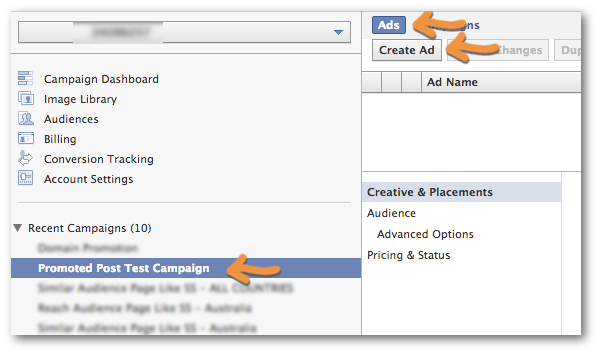 But if you go into your self serve Facebook ad tool, you’ll see this campaign created. 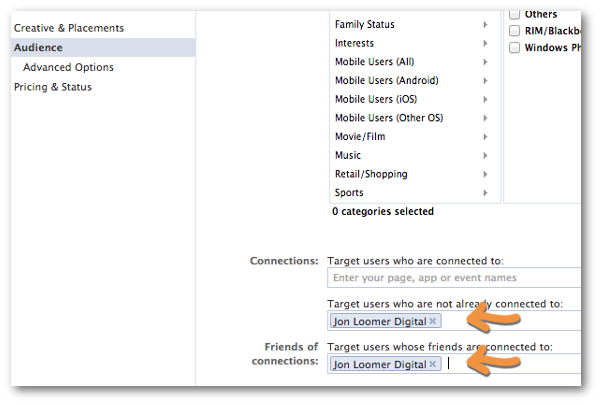 I’ll say this until I’m blue in the face: If you want optimal control over your Facebook ads, you must use Power Editor. Simply go here to use Power Editor. It’s free. If you need help, read this tutorial. 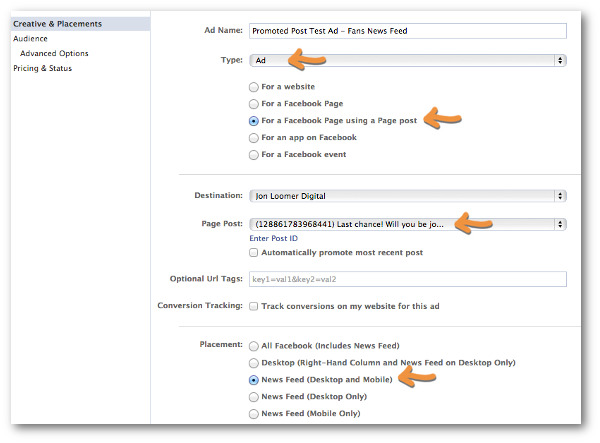 Next you want to create the ad that will appear in the News Feeds of Fans. While the campaign you just created is highlighted on the left, click Ads and then Create Ad. Within “Audience” make sure to enter all of the countries you want to target. 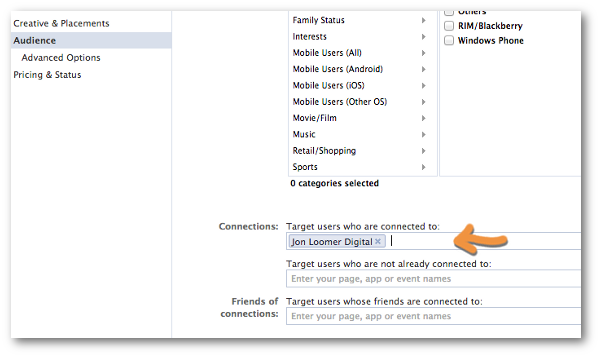 Further down, make sure to enter the name of your Page under “Connections: Target users who are connected to…” This will make sure that your ad only targets your Fans. That’s it for this ad. From here, you can customize however you want. I’ll get to that later. This will then promote your post in the News Feeds (mobile and desktop) of friends of Fans. As in step #2, feel free to split test! Finally, we need to create the Sponsored Story that goes into the News Feeds of friends of Fans. 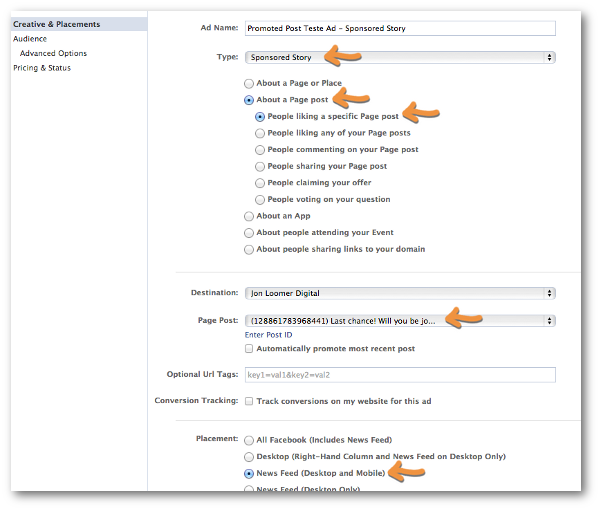 You could also create ads that leverage people commenting on or sharing your Page post. Up until now, all you’ve done is replicate what is done when you click the “Promote” button. You spent a few minutes doing what you could have done in one second. Of course, that’s not helpful to you. What you want is to now have more control over your campaign. The possibilities are endless. Knock yourself out!